Fred is an associate at Gavin Law Offices, focusing on intellectual property and transactional law. Fred has experience in trademark registration and enforcement, entity formation and dissolution, copyright enforcement, as well as transaction and contractual matters. Fred is a graduate of the College of William & Mary Law School, where he concentrated his studies on intellectual property and contractual law. While in law school, Fred wrote an independent research paper detailing the applicability and untapped potential of copyright law in the protection of logos, in light of the aesthetic functionality doctrine of trademarks. Fred earned his undergraduate degree in economics from Virginia Tech, with a double major in philosophy. After graduating from Virginia Tech, he lived and worked in Charlottesville, Virginia for two years, where he met his future wife, Christina, before heading back to school at William & Mary Law. 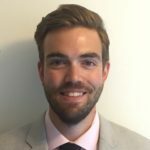 Before becoming an associate, Fred began his career at Gavin Law as an extern during his spring semester of the 2017 school year. In his spare time, Fred enjoys long distance running, hiking, discovering new shows and movies, and spending time with his wife and two dogs, Hudson and Pete.